Not sure where to start with John Scalzi? Read our introduction and get stuck in. John Scalzi is an incredibly popular, award-winning science fiction writer. He’s the author of the Interdependency trilogy, the Old Man’s War series and Lock In - as well as a number of fantastic standalone novels and novellas. If you’re new to his worlds, here’s a great place to start. John Scalzi’s most recent series, The Interdependency, is a space opera trilogy based around ‘The Flow' – stable wormholes that have allowed humanity to establish a galactic empire through faster than light travel. And thanks to the leader of the Interdependency, The Emperox – an inherited title whose role is now largely ceremonial – it was a relatively peaceful civilization. But when it looks like The Flow isn’t as stable as it seems, things inevitably start to unravel. The first two books in this hugely exciting series are The Collapsing Empire and The Consuming Fire. Well, it all started for John with the Old Man's War universe, a six novel military science fiction series (with associated novellas). It’s centred around the idea that, upon hitting age seventy-five, you're shipped off-planet and retrained in the military. Then your consciousness is transplanted into a new body, genetically modified for combat. And you’re told to kill a whole lot of weird aliens for various reasons. John Scalzi has another series, a duology, entitled Lock In. The title refers to Haden’s Disease, a highly contagious virus that spreads across the globe. It leaves an unlucky minority of people fully conscious, but unable to use their bodies - so locked in. Luckily, Hadens (the name given to those suffering from this) can navigate the Neuronet and pilot Threeps, robotic-humanoid bodies, in order to keep interacting with the world. In Head On, the next book set in the Lock In universe, Scalzi imagines an ingenious twist to this new culture by inventing a sport called Hilketa. This is played exclusively by Hadens. Think American football, but with swords and weapons, and a decapitated Threep head as the ball. It’s a slight change of pace from his usual works, and more of a neo-noir or semi-utopian cyberpunk thriller than a pure space opera. John has maintained his fantastic blog since 1998, and it’s much more than the occasional promotional glimpse into his life. It contains many kinds of musings, from John’s writing process to actually launching books, as with Old Man’s War, which was initially serialized on the site before being picked up for a traditional publishing deal. John also hosts guest pieces from other exciting writers on his blog. The best of the Whatever blog has even been compiled into three books: You’re Not Fooling Anyone When You Take Your Laptop Into a Coffee Shop: Scalzi on Writing, Your Hate Mail Will Be Graded: A Decade of Whatever 1998 – 2008, and The Mallet of Loving Correction. They’re all gems - either for a general peek into the life of one of science fiction’s most enduring writers, or as background colour if you’re already a fan. We may be entering a new golden age of science fiction and fantasy film and TV adaptations – and things could get even better with two Scalzi titles being optioned for the silver screen treatment. Netflix have optioned a film version of Old Man's War – and even though there are plenty of side stories, the central narrative is succinct enough to work as a stand alone film. Then there’s the option by Working Title to turn The Collapsing Empire into a TV series. This is terrifically exciting, given the space-opera-with-compellingly-quirky-characters hole left by The Expanse. 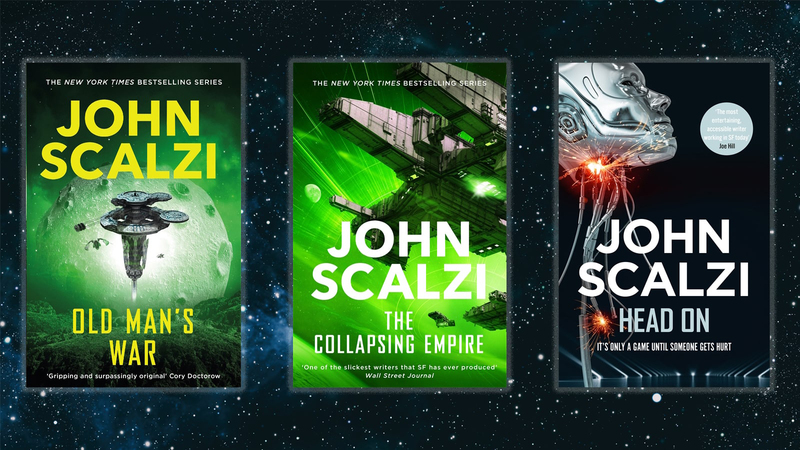 The prospect of a Scalzi film and series is something to get excited about – so here’s to those options turning into TV or film gold.